A famous chef, Fritz Schmidt, has commented, “Sometimes the best restaurants will turn up where you least expect to find them”. And so it is with The Lazy Loggerhead. 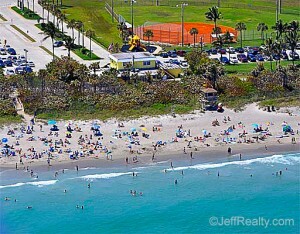 The Lazy Loggerhead is located within Carlin Park, a Palm Beach County oceanfront park located on the south side of the Jupiter Beach Resort where Indiantown Road meets A1A (Beach Road). 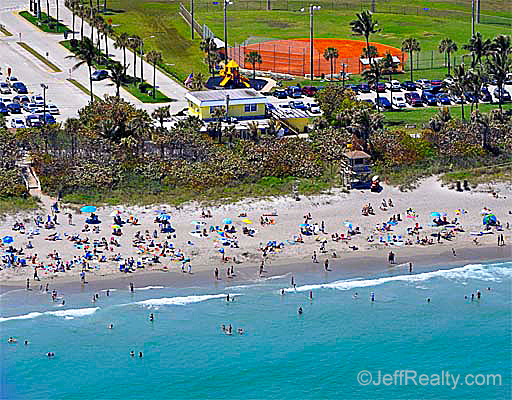 Not very big, but with a feel of the Caribbean Islands, you walk in from the beach or park and walk up a rise to get to it, waterfront dining in Jupiter. You can dine inside or sit outside and watch the beach crowd at this big park. I like to sit inside and watch people through the large windows. The food is tropical with fish and fruits, imaginative, and not too costly. Your best bet is for each person to order something different then share…just like Chinese food. Then nobody misses out. Like many of these small, local favorites, the Lazy Loggerhead gets very busy during the season and they require that your entire party be there before being seated. This stops the early birds from grabbing all the tables while others stand and wait for a table. I have eaten here with business clients, my wife and family, and friends. Everyone will feel comfortable with the style of the place, whether you have on a white shirt and tie or flip-flops on sandy feet. The only thing you can’t do is arrive by boat, but you can do that at other restaurants like the Waterway Café or the River House in Palm Beach Gardens. The location is close to communities like Jonathan’s Landing, Ocean Trail, and Jupiter Cove, all of which have waterfront properties for sale. So give the Lazy Loggerhead a try and you will certainly be coming back for seconds. Posted in Palm Beach County homes, Palm Beach County homes for sale, waterfront homes on November 10, 2010 at 9:17 am.